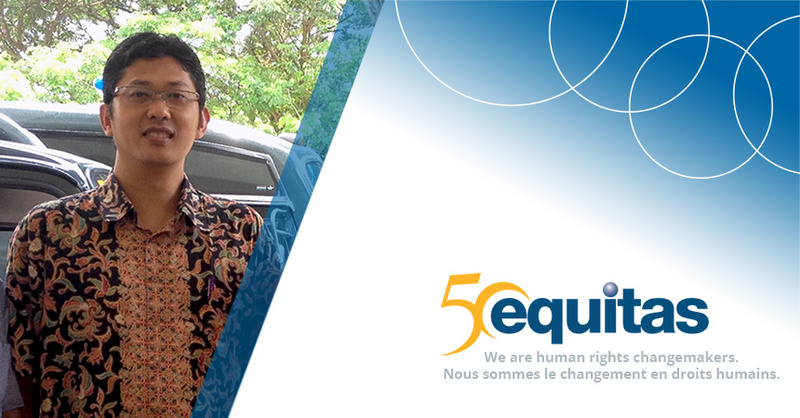 This story is part of the series We are human rights changemakers to celebrate Equitas’ 50th anniversary. All through 2017, we invite you to discover stories of 50 inspiring human rights changemakers. These are but a few of the hundreds who have changed lives around the world through human rights education with Equitas’ support. Teaching about human rights at the university level has Herlambang Perdana perfectly positioned to network with human rights educators and activists throughout Indonesia and other Southeast Asian nations. In the eastern Java city of Surabaya, Herlambang lectures on human rights at the law school of Universitas Airlangga. He also presently serves as chairman of the law school’s Centre for Human Rights Law Studies. In addition, he is completing a two-year term as chairman of the Indonesian Lecturer Association for Human Rights (SEPAHAM Indonesia). Along with these duties, Herlambang is active with 24 human rights groups throughout Southeast Asia. After former Indonesian President Suharto stepped down in 1998, there was some reform, Herlambang said, but human rights abuses still occur. Instead of being carried out by police or paramilitary personnel, however, these are now perpetrated by corporate interests who employ what Herlambang calls “privatized gangsters” to make – and carry out – threats. Academia is particularly vulnerable to intimidation tactics by those in positions of economic power. For instance, he said if he were to write a research report that cast a company in a bad light, “those in charge will report to authorities that my report was wrong, and call it defamation or libel.” Tactics like these effectively silence the voices of the people and “hijack” the political arena. “So the sickness remains unresolved, in some cases,” he said. Repression against academia and civil society is one of the key reasons it remains so important that Indonesia and all the other ASEAN (Association of Southeast Asian Nations) countries communicate with each other and hold annual human rights conferences. The Southeast Asian Human Rights Studies Network (SEAHRN), which Herlambang founded in 2009, organizes such conferences and regional platforms to discuss issues such as LGBTQI rights (Lesbian, Gay, Bisexual, Transgender, Queer and Intersex), and migrants’ rights. After Herlambang earned his bachelor’s degree in 1998, he worked for several years as a lawyer with Indonesian Legal Aid, defending impoverished people and victims of violence. He started his current job in 2003, and had the opportunity to attend the Equitas’ International Human Rights Training Program (IHRTP) in 2005. Afterward, he earned a master’s degree in human rights in Thailand and a Ph.D. at Leiden Law School in the Netherlands. “I learned a lot from such training, especially improving my teaching methodology in human rights, and how to connect with the people and educate them on human rights,” he added. Indonesia is one of the nations in which Equitas has an alumni association for past participants of the Montreal IHRTP. These alumni have provided annual trainings in Indonesia similar to those Equitas offers in Canada. Because of his Equitas experience in 2005, Herlambang was qualified to be a facilitator of this local training, teaching human rights education for three weeks. “I’d never done anything like that in my life,” he said. “Equitas helped us with that, to not be boring.” Participants came from NGOs, human rights groups, government institutions, and law offices to exchange in this safe space and go back to their home countries with new tools and solutions to address human rights issues. Herlambang said he does feel his work is making a difference. “I believe education empowers people in defending their rights,” he said. Equitas’ International Human Rights Training Program is undertaken in part with the financial support of the Government of Canada provided through Global Affairs Canada. Did you like this story? Give us your support! Even the smallest donation contributes to big impact in Canada and around the world.